How do experts memorize alphagrams with the words? DO THEY ACTUALLY CRAM THE ALPHABETICAL ARRANGEMENT WITH THE WORDS, OR DO THEY JUST ROUTINELY FAMILIARIZE THEMSELVES WITH THE ARRANGEMENT. I AM TRYING OUT ALPHAGRAM STUDY OF 7'S BUT I AM FINDING IT UNEASY AS IF ONE IS ACTUALLY SUPPOSED TO CRAM THE ALPHABETICAL ORDER IN ORDER TO GET THE WORDS, THEN IT IS REALLY A TOUGH JOB BECAUSE MOST HIGH PROBABILITY WORDS HAVE VERY SIMILAR ALPHAGRAMS. SO WHICH PATTERN OF MEMORIZATION DO EXPERTS EMPLOY: OUTRIGHT CRAMMING OR ROTE FAMILIARIZATION? Hi there Dennis - Firstly, for the benefit of readers who don't know what alphagram study is all about, you might like to check out my Anagram Solving Tips before reading my answer to this question. Basically, the alphagram method of study does indeed just come down to straight memorization. I'm not sure what you mean by the difference between 'outright cramming' and 'rote familiarization', but basically you rehearse the alphagrams until they become almost as visually familiar as ordinary words. 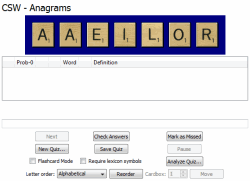 The most popular tool for memorizing alphagrams using flashcards, by the way, is called Zyzzyva, which I describe in my Scrabble Helper Library. It's brilliant, and free! The image I placed at the top of this post is a screenshot of an alphagram quiz using this app. You are right that many alphagrams do look very similar, but you'll be surprised how the brain sorts them out after you've been living and breathing this anagramming method for six months or so. Comments for How do experts memorize alphagrams with the words? tanx bro for your reply. i m really appreciative of the way u explained it. yet, the act isnt an easy one if we have to actually memorize the alphabetical arrangement as u say. tanx a bunch though!